Your website comes with four sections already installed: Header, About Us, Contact Us, and Footer (plus Subscribe for the Online Store/eCommerce plan). 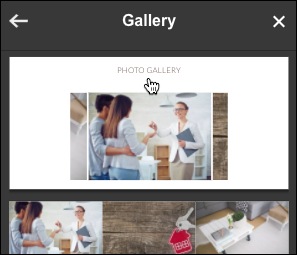 You also can add new sections and customize them by renaming them, changing or removing the boilerplate text, and deleting or replacing the photos. Note: You can add up to 20 sections on a page. If you need more, you can add more pages. Note: You cannot add another Header or Footer. But you can add more than one Menu/Price List, Files, or Social section. Click one of the sections listed in the Add Section panel. Click the layout choice you want to use. 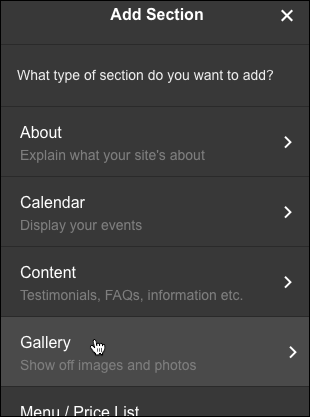 When the Section Added confirmation appears, click the new section to customize its options, starting with the title. Note: If you change your mind about adding a section, you can Delete a section by clicking the last choice in that section's three-dot menu. Your changes are saved automatically so when you're finished, click Preview to see the results, and, if you like, use another of your domains or buy a new one. How do I add my product to a section? 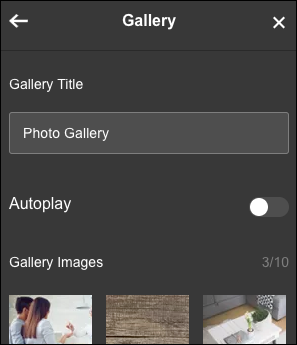 Is there a section I can add to a website that allows secure file uploads?